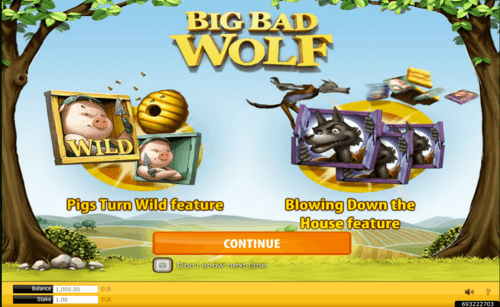 Developed by gaming software developer Quickspin, Big Bad Wolf slot game is one game that will surely get players' entertained for a long time. Big Bad Wolf is a slot game that comes with five (5) reels and twenty (20) paylines. 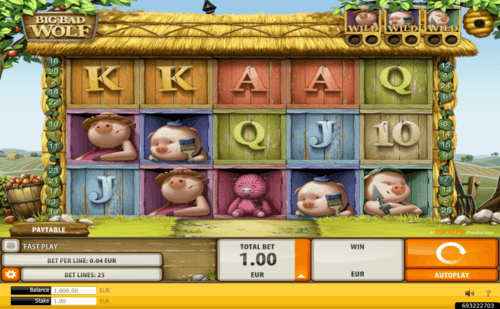 This slot game is a fairytale themed game that tells the story of 3 little pigs. Like most slot games, the Big Bad Wolf has the wild symbol and scatter symbol. The wild symbol is aptly represented on this slot game by Hive while the scatter on the other hand is represented by the wolf. 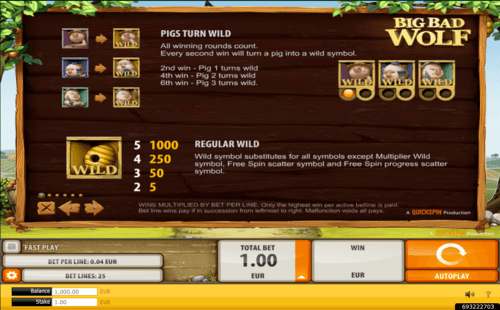 This slot game is based on the popular nursery rhyme titled; three little pigs. Some of the features of this slot game include; an autoplay feature, cascading reels, a multiplier, wild pigs, swooping reels and the amazing free spin feature. This slot game has other bonus rounds. This slot game like other slot games comes with the low-value symbol cards which include; A, J, K, Q and 10. This slot game is designed in such a way that a thatched roof houses the reels with the wolf symbol standing on the left side of the reel ever ready and eager to blow the house down. This game is played in such a way the players will have to team up with the little pigs in their never-ending fight with the big bad wolf. To start playing, players will have to adjust their stake or bet. The coin value for every spin is from 0.1 to 5 coins. The autoplay feature on this slot game is clicked by players who want uninterrupted spins. For players to successfully blow down the house on this slot game they will have to land three moon symbols. This slot game is one of the most entertaining and rewarding fairytale-themed slot game you will find around. When you play this game you will notice that the game is designed in such a way that beginners can easily understand and try their lucks to win huge prizes. This slot game is a cartoon styled slot game, and it comes with great sound effects that ensure that players do not get bored when they play this amazing slot game. This slot game has a return to player percentage of 97.34%. This slot game comes with multiple bonus features that will interest every slot game player. One of the bonus features happens to be the swooping reels feature. This feature is often called the cascading reels bonus feature. What this feature does is that; when players get winning combinations, it makes them disappear immediately allowing more crates from above to replace them thereby creating more winning combinations for players'. The more winnings players get from this bonus feature, the more they move further on the Pigs turn wild bonus feature ladder. Another bonus feature is the pigs turn wild feature. If you look closely on the screen of this slot game, you will notice three pigs each with two circles below them. Each cascading reels that happen when players land winning combinations will fill one circle, but if two circles are filled, the first pig turns wild. If four circles are filled, the second pig turns wild, while six filled circles turn the third pig wild. These wilds add up to each players' winnings at the end of the swooping or cascading reels bonus rounds. Another bonus feature of this amazing slot game is the free spin feature. This feature is triggered when players land at least three or more scatter symbols. Once this feature is triggered, you will see the wolf on this slot game blow down the roof house. When this happens, know that the free spin feature has been triggered. If a player is lucky to land the moon symbol while on the free spin, he gets two more free spins. Landing six moons will give each player additional two free spins and a two times multiplier on all winnings. You can play this bonus-filled slot game on the Money Reels online gaming website. This slot game was developed by Quickspin a Swedish game developing studio. Quickspin has taken a firm resolve to develop high quality and innovative slot games that they believe that if they were to play them they would totally enjoy playing them. They have a team of determined and customer friendly staff that bring up innovative and trendy ideas that ensures that they develop games that players would love to play. Most games developed by this slot game are bonus filled ensuring that players are well rewarded. Since its establishment, Quickspin has developed over 20 slot games which include; Beowulf online slot, Supernova, Fireloom, Goldilocks Slot Game and a list of other bonus filled slot games. Golden Sphinx is one slot game that shares the same theme with the Big Bad Wolf slot game. Golden Sphinx-like the Big Bad Wolf is a fairytale themed slot game with amazing features. Puss N Boots is another fine slot game that shares the same theme with the Big Bad Wolf slot game. Developed by Red Tiger Gaming, this amazing slot game like the Big Bad Wolf is a fairytale themed slot game. Diamond Dragon happens to be one slot that shares similar features with the Big Bad Wolf slot game. Diamond Dragon like the Big Bad Wolf comes with five reels, a free spin feature, a multiplier, an autoplay feature and the wild and scatter symbols. Magic Unicorn is another slot game that shares similar features with the Big Bad Wolf slot game. It comes with the scatter and wild symbols, the free spin feature, the multiplier and rewarding bonus rounds. The Big Bad Wolf slot game and hundreds of games with same features are available for play on the moneyreels online gaming website. There is no clear or significant difference between playing this bonus-filled slot game on either your mobile phone or your desktop or laptop computer. Although players playing with their computer will enjoy this game on a much wider screen.